Very much an action sport, this commemorates the golfer as he is captured in the moment in molded glass, with an optic crystal base. Award comes unattached from base, UV attached by engraver. 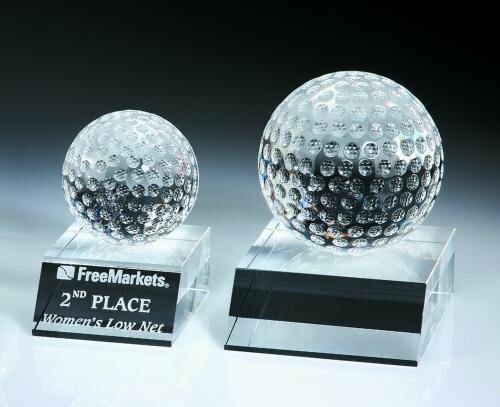 Triumph rings loud and clear with this award, honoring the champion golfer in all his glory with a prominent figure imposed on a golf ball background in molded glass; optic crystal base. Award comes unattached from base, UV attached by engraver. 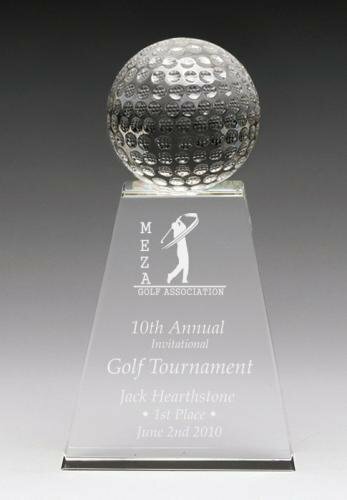 Capturing the excitement of golf, this award pays homage to to players of the game cast in molded glass and set upon an optic crystal base. Award comes unattached from base, UV attached by engraver.